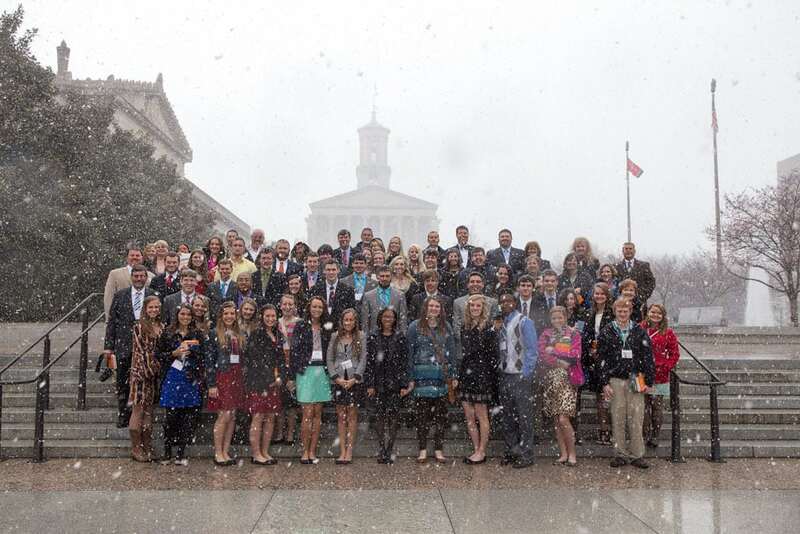 Forty-six high school juniors from across Tennessee attended the Tennessee Electric Cooperative Association’s 2014 Youth Leadership Summit March 24-26 in downtown Nashville. Two students from each of the state’s 23 electric cooperatives attended the annual event. The summit began Monday evening, March 24, with dinner at the group’s hotel, the Millennium Maxwell House. Get-acquainted activities and an introduction to cooperatives followed, led by electric co-op leaders, and the night ended with a leadership development presentation by Amy Gallimore of TRI Leadership Resources LLC. Students rose early on Tuesday, March 25, for breakfast and preparations for a visit to Legislative Plaza. TECA Director of Government Affairs Mike Knotts introduced Sen. Mike Bell of Riceville and Rep. Cameron Sexton of Crossville, who welcomed the students to Nashville and answered their questions about legislative issues. The 11th-graders then toured the Capitol and saw state government in action at Senate and House committee meetings before posing for photos in front of the historic building. Following the visit to Capitol Hill, the group enjoyed lunch and leadership activities at a Nashville-area YMCA camp, where the students were also treated to a hot-line trailer demonstration by Sequachee Valley Electric Cooperative and Sunbelt Rentals. SVEC employees showed that electric power does a tremendous amount of work for us, but because it is such a powerful force, we must be careful around it and always exercise safety around power lines. The fun continued with dinner and games at Dave & Buster’s, and the busy day was capped off by special guest speakers Miss Tennessee Shelby Thompson and Tennessee Titans cheerleader Anne Peterson. Wednesday morning, the students were divided into teams and formed their own co-ops and worked together to “buy” and “sell” power distribution supplies and resolve day-to-day issues local electric co-ops face like power outages and rights-of-way conflicts. Then they got an overview of the history of electric cooperatives and answered trivia questions about electric co-ops and the state in the “Energy Battle” competition.